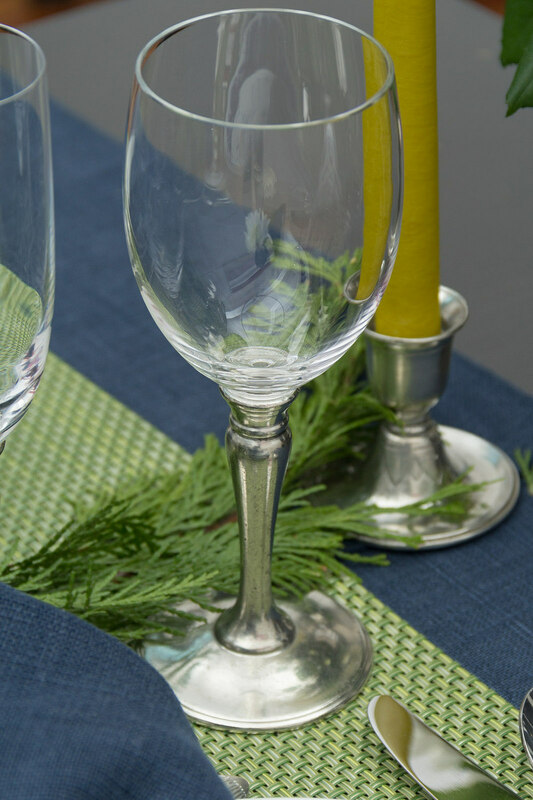 The last of my holiday guest post series for the Didriks blog I call a Serene New Year’s table. This is a table intended for adult gatherings. You probably have noticed that the combination of navy and green colors has been used in fashion for the last few seasons and I think it is still fresh to the eyes. With the white flowers, it also brings in a slight vibe of winter. This color scheme mixed with Italian pewter tableware gives this table the serene elegance for a more formal party - but not too buttoned down. 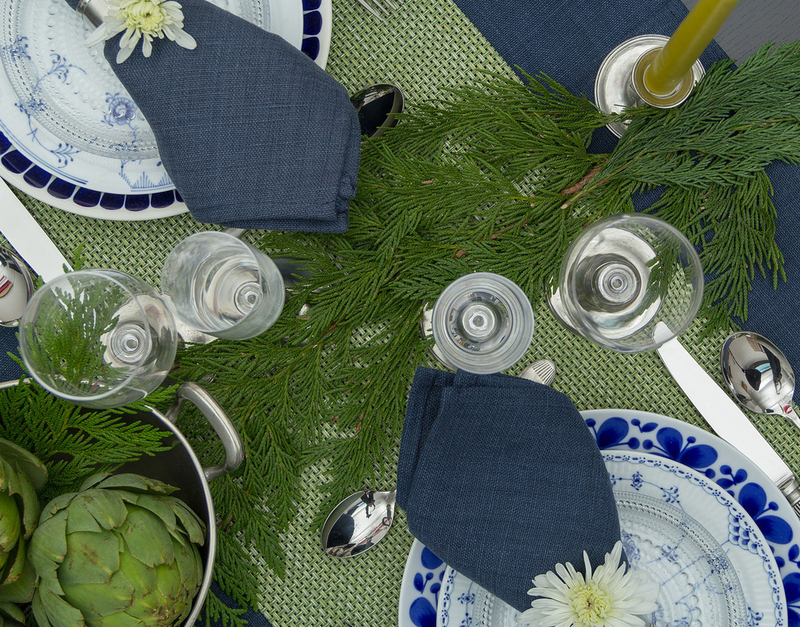 Libeco Home Napoli Vintage linen in navy is used for both tablecloth and napkin. The Chilewich Basketweave table runner in grass green makes the color contrast with the blue that is the core of this table. The rest is easy. Using white and blue dinnerware makes this table traditional and elegant, but also fun, because of the mix and match of patterns - a contemporary tabletop trend. The two dinner plate patterns are the Arabia 24H Tuokio pattern and the Rorstrand Mon Amie collection. Salad plates are from Royal Copenhagen. I picked ones from each collection, Blue fluted Mega, Blue Elements, Blue Fluted Plain and Blue Fluted Half Lace. 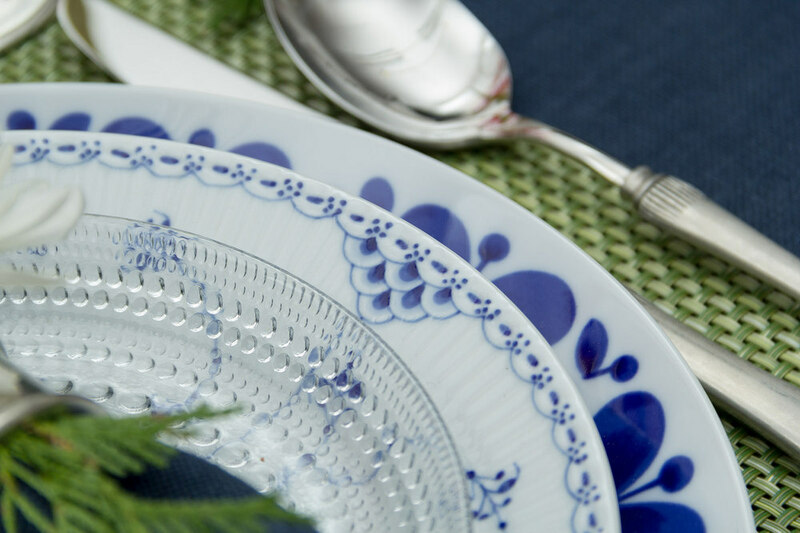 Iittala Kastehelmi salad plates bring some dewy shine to the setting. The distinct soft silver color and the classic shapes of Match pewter from Italy give this table a finishing touch in the elegant direction. Daniela flatware, the all purpose wine glass and champagne flutes, short candlesticks, Vaso vase and beaded rim footed bowl are all from Match Pewter. 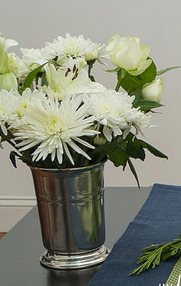 The Champagne bucket I used is from Simon Pearce, but a Match Pewter Champagne bucket would also work splendidly. 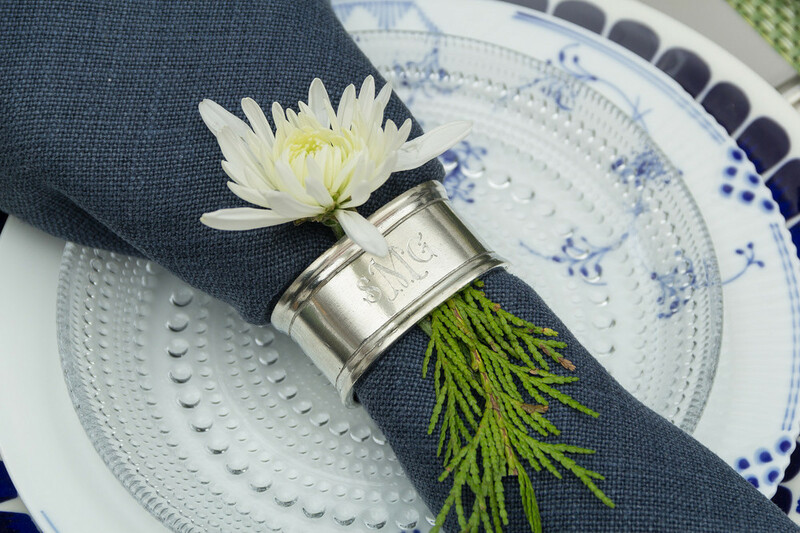 You play within the navy, green, white and pewter silver color scheme for decoration and you'll have this serene New Year's table theme in a flash. - Guest Blogger and Table Designer: Toyoko S.